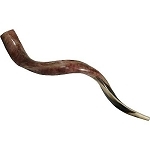 Sound this superbly polished Shofar any time of the year, especially during the High Holidays. Its blower-friendly mouthpiece is enhanced by its classically beautiful appearance. Size: 116-121 cm / 46-48 inch.